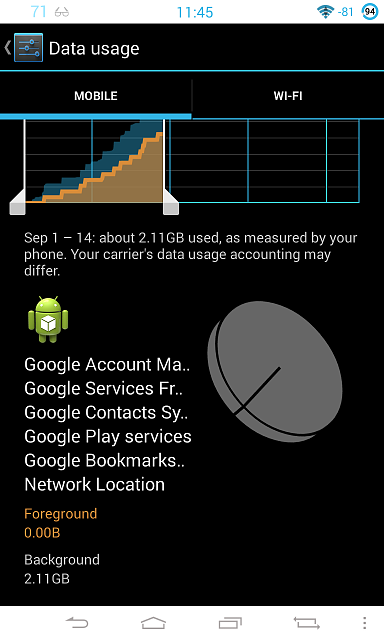 Any Idea why google services is using so much of my data? Phone is reporting 2.11GB used and alll of it is in the background. That is nearly half of my 5Gb allowance for the month and I still have more than half a month to go. Very surprising. 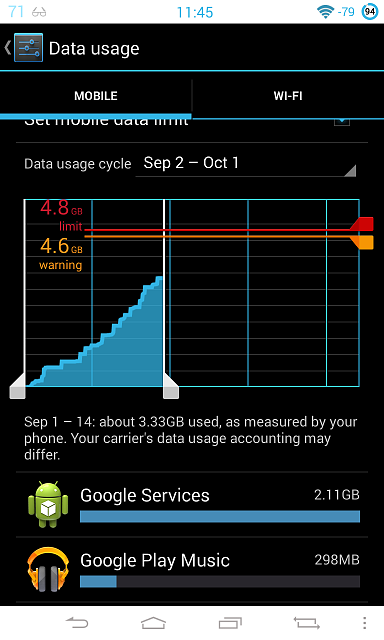 My Nexus 4 only uses 200mb per month. Try playing around with the settings and see what it it does. Search this forum. There have been some recent threads on this. I think the cause is repeated downloading of system updates and you need to reset what's causing this behaviour. yes, do a reset, I have 250 meg allowance and have over 100 meg left over each month. Not a factory reset...I think clearing cache of some service was sufficient but you would have to find the thread to double check the advice. Is Google waiting for Kitt Katt? By Sister Honey in forum New to the Forums? Introduce Yourself Here! Help, please: latest Google system update, what..? How to make video call from skype app?